CASTON - On the fourteenth day of November 1818 it was certified by John Robert Barnard and Thomas Warren, Trustees for a Chapel lately erected in the Parish of Caston in the County of Norfolk and Diocese of Norwich (by a written certificate under their hands bearing date the thirteenth day of the same instant November) That the said Chapel is intended forthwith to be used as a place of religious worship by an assembly or congregation of protestants. Directories from 1845 to 1865 give the Chapel as belonging to the Wesleyans but by 1878 it had become the property of the Primitive Methodists who in that year undertook restoration work which included encasing the clay lump with brickwork. There is a local belief that the building was once owned by the Wesleyan Reform Union which was formed in 1859. If ownership passed from this body to the Primitive Methodists it must have been a unique step having regard to the relationship existing between them. Indeed the Primitive Methodists did not recognize the Wesleyan Reform Union. family and The Chapel which existed in 1818 and which still exists through Miss Ivy E. Barnard and her relatives in 1974, although it does seem that there was no direct line of descent. 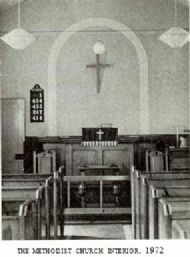 The schoolroom, with seating for about 120, and with a coal store at its southeastern end, was added in 1924 to the rear of the Chapel and at right angles to it. In 1969 the coal store was converted into a kitchen and toilet, the latter replacing an earlier bucket lavatory outside. A folding partition enables part of the schoolroom to be used as a vestry. There are two framed pictures, one of Mary with the infant Jesus and another of Jesus on "The Hilltop at Nazareth", the latter presented by Mr. and Mrs. James Banham of Hendon, Middlesex, in 1951 in memory of Mr. Banham's grandmother, Mrs. Houchin. Mr. Banham's widow Olive is sister to Mr. Charles Banham, Church Warden: an ecumenical link. A Memorial Panel in the southeastern wall of the schoolroom bears names and initials of those who laid bricks in the panel on 4th August 1924. A commemorative card records that the Minister was the Rev. G. R. Brake and that Mr. Ernest Buckle (for over 33 years village sub postmaster) was Treasurer. W.M.W.-Winifred M. Ward; I.E.B.-Ivy E. Barnard; E.F.-Ernest Flowerdew; H.C.-Harriet Cator; J.T.B.-James T. Bambridge; G.W.M.-George W. Murrell; G.W.E.-George W. Eagling; A.T.C.-Albert T. Cator; A.C.-Arthur Cator. Of these people, four are still resident in Caston in 1974: Mr. Edward Knott, organist at the parish church; Mr. Leonard Balls and his sister Eva, now Mrs. Nicholls; and Miss Ivy Barnard. Miss Barnard's sister Hilda, now Mrs. B. E. Cooke, lives a few yards over the parish boundary in Griston. Mr. J. Stubbs, who is believed to have been a Local Preacher, lived in nearby Thomp¬son. He was one of the original Trustees at the time when the Primitive Methodists took over the church. Electricity reached the village in 1935 and the Chapel was one of the first buildings to be connected to the mains, thus ousting the paraffin lamps. Heating was for many years provided by a solid fuel freestanding "Tortoise" stove, its great efficiency being aptly described by the motto it bore: 'Slow but Sure'. It was replaced by a white enamelled solid fuel stove in about 1955 which was in turn replaced by oil fired central heating in 1971. The present harmonium, bought new in about 1930, replaced a pipe organ which had been obtained second-hand from Watton. In 1964 the interior of the Chapel was re-decorated and modernised. At the service of Opening and Dedication on Wednesday 15th July 1964 the opening was carried out by Mr. Jesse Macro of Wattlesfield, Suffolk, a Trustee from 1905 until his death in 1973. Caston. In the Methodist Church a Trustee is normally elected for life, regardless of subse¬quent movements, and a new Trust is not normally elected until membership of the existing Trust falls below six in number. In 1878 Caston was in the Downham Market and Watton Circuit, but at about the turn of the century, the Downham Market area formed its own circuit and Caston became part of Watton Circuit. In 1934 an amalgamation produced Watton and Rocklands Circuit and by reorganisation in 1968 Caston became part of the Wymondham, Attleborough and Watton Circuit. The minister at present lives in Watton and the Circuit Superintendent lives at Wymondham. Caston Methodists have never had a burial ground of their own, having shared the graveyard of the parish church. The usual practice at a Methodist funeral is that the funeral service is held in the Methodist church and the committal at the graveside at the Church of the Holy Cross. The first such funeral was that of Mrs. George Murrell, Miss 1. E. Barnard's maternal grandmother, in 1881, and the church register is signed not by the Rector, but by the "person in charge of the funeral", George Murrell. 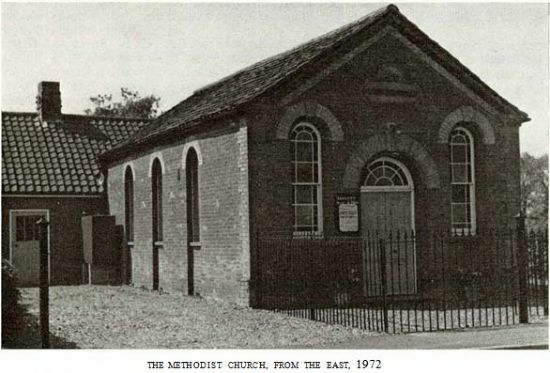 The Church of England discriminated against the Methodists by refusing to permit a bell to be tolled, a practice which has since ceased for its own members.